Purchase this product now and earn 640 Points! 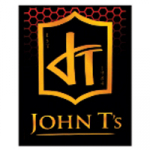 John T’s Cigars are the worlds only hand rolled pipe tobacco cigars, made in the Dominican Republic with premium cigar leaf and tobacco. Rolled with aromatic pipe tobacco, the head is dipped in Dominican rum & honey. Coming in a variety of flavors including: Vanilla, Chocolate, Strawberry Daiquiri, Cherry Cream, Peach Whiskey and Rum & Cola. The perfect on the go cigar, these petite sized smokes are so delicious you’ll want to smoke them anywhere!